I have two non-pattern sewing projects to share today. 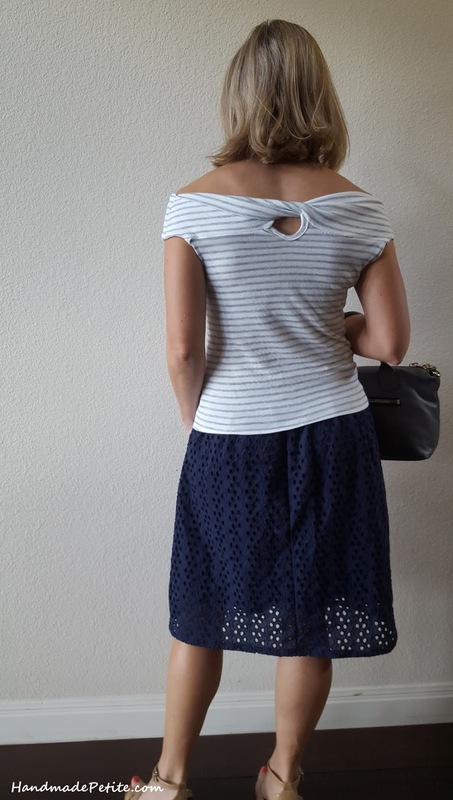 Eyelet skirts and dresses have a big trend this summer and after looking at a bunch of inspiration photos, I decided to just draft a skirt myself. I had a general style in mind and then when the fabric arrived I was just playing with the layout and thought some subtle box pleats would work great. I only bought I yd of fabric and based on the width I had to go with the 2" to 1" ratio instead of uniform 1" pleats, but I like the look just the same. For the closure I used an invisible zipper on the left side. The eyelet fabric is a cotton poly blend. It looks and feels like cotton, but I'm hoping the poly will keep it from wrinkling as much. Of course since the fabric is eyelet, it had to be lined. The lining is lightweight cotton, I think lawn. I sewed it up the same way as the top. The one change I made from a regular skirt was have the lining seams face the inside of the skirt so they don't show through the eyelets to the outside and use flat felled seams wherever possible to keep the inside of the skirt neat. Another design feature that you can see from the pictures is that the lining is quite a bit shorter. 5" to be precise. That's also intentional to show off the eyelet fabric. The fabric was easy to work with and I'm happy with how the inside of the skirt turned out. When I was done with the skirt, I realized I didn't have enough tops I could pair with it so enter sewing project #2 - the twist top. I had a really old (15+ years) top from Victoria's Secret that had a very neat front and back loop twist design that could be worn as a regular top or off the shoulder. Now that I'm older, I love when fashion trends cycle back decade after decade so I can make my old clothes new again. Not that I hoard all my old clothes for that long, but I definitely still have some good fitting and good quality pieces that I've had since my early 20's. Unfortunately after many years this original top shrunk a bit and fabric faded so I decided to try and rip it apart to copy the pattern. The fabric was obviously knitted in specific shape for this top so I had to improvise in a few places, but this was my first attempt at recreating it. It's not perfect and, but it's a wearable muslin and I achieved recreating the style. I plan to make it again and play around with the sewing order as well as lengthen the hem a bit. If I get it to the point where I'm happy with it, I'll post a tutorial on the blog. In the meantime I still plan to wear it because I like the subtle grey stripe pattern with this navy skirt. Really cute, and so great that you drafted them yourself. I've looked for eyelet that color but haven't had any luck, so envious! 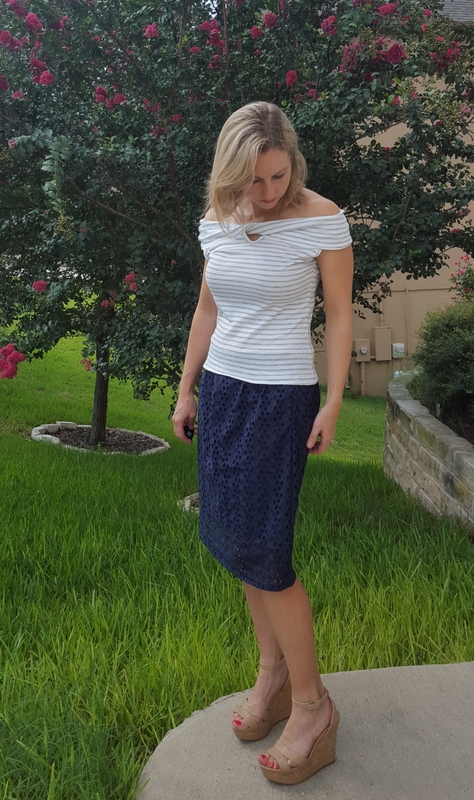 The top is great too and the subtle stripe looks perfect with the eyelet.I have a RTW top that's really old...you've inspired me to take it apart and make another. Thank you for the sweet comment. 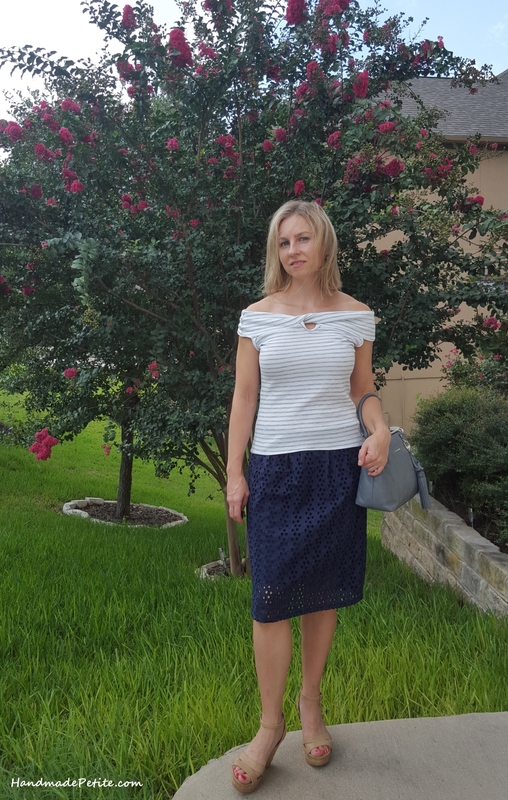 If you're still looking for eyelet fabric, I got mine at fabric.com https://www.fabric.com/buy/0435167/cluster-cell-eyelet-navy. This exact one is sold out, but they have a few other navy patterns.The lining is from there too or from Fabricmart. I threw a few fabrics to prewash without thinking and lost track of which was which. What an interesting top. Nice job!